At the end of Milton Keynes Gallery’s exhibition of work by Andrew Lord, upstairs past three galleries of exquisitely installed ceramics, plaster sculptures and drawings, is a one hour 43 minute-long video of Lancastrian morris dancers performing in blackface. Lord, a Lancashire-born artist now living in New York, has said that ‘Making objects has been a way for me to understand things I’ve found incomprehensible’. Britannia Coconutters dance through Bacup, Easter Sunday (2009) is one of a series of films made by the artist over the past three years in and around the area in which he was raised. Despite his incomprehension, it is possible that Lord recognises something of the tradition’s defiant oddness, and its anachronism, in his own practice. Lord has spent much of his four-decade career making ceramic vessels and studying Meissen porcelain and the glazed terracotta of the Della Robbia workshop. He would bristle, however, at being labelled a potter. Sixteen Pieces. 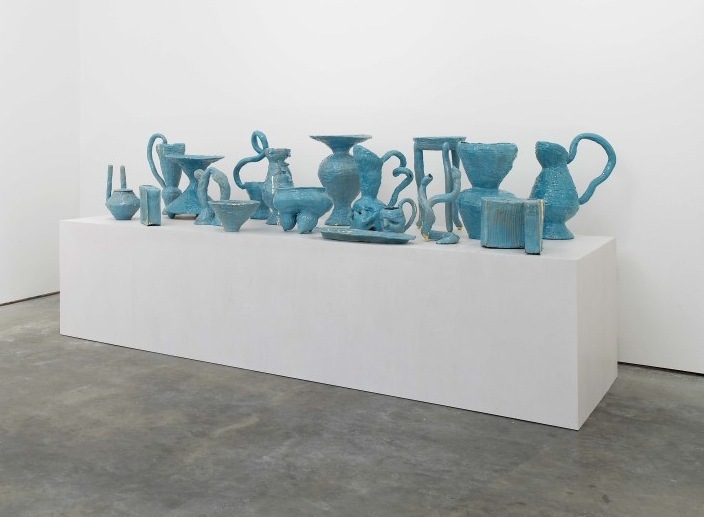 Angled (1986), one of the earliest and most striking works in the show, is his attempt to give form to the shadows thrown by another group of rounded jugs, vases, cups and bowls. The result looks like a spiky black Soviet tea set remade by Richard Serra. Nearby, Lord has taken Edgar Rubin’s famous optical illusion – the vase whose contours describe the negative space of a face in profile – and applied it to Marcel Duchamp’s distinctively aquiline features. For Profile vase (Duchamp), ‘Lunch Poems’/O’Hara, weight, left and right eye (2002) Lord has complicated the illusion by dangling on threads a ceramic plumb-bob and casts of his own eyes where Duchamp’s eye and brain would be, perching the whole lot on a volume of poetry by Frank O’Hara. These two works tether the artist’s chief preoccupations: an impulse to give form to the ineffable (whether shadow, thought or optical effect) with fingers and wet clay; a fascination with what is lost – and found – in translation between two and three dimensions; and an attentiveness to the work of his forebears that often manifests itself in reference and homage. The ceramic vessel is an ideal carrier for such splashy concerns. It is, formally, a plane folding itself into an object. And it is modelled around an absence; its ‘thingness’, as Heidegger pointed out, ‘does not lie at all in the material of which it consists, but in the void that it holds’. Lord does not limit himself to jugs, of course. Many works, such as the wall-mounted inside my mouth (2010), feature plaster or beeswax impressions of parts of his body. In the stunning final room of the exhibition, attenuated forms based on images from Lord’s childhood – Blackpool Tower, a Lancashire valley and, of course, that sinister morris dancer – are summoned like pale memories beneath gloopy, crackling glazes. Lord’s fingers leave impressions everywhere. His body is the void held by these objects, his identity that which gives them their ‘thingness’.